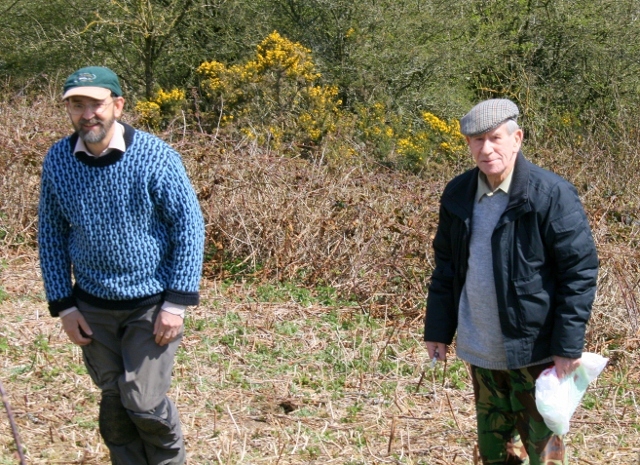 Eight keen volunteers turned up for a nice sunny day’s digging. One of the highlight’s was my mother, Peggy’s 71st birthday – cake all round! 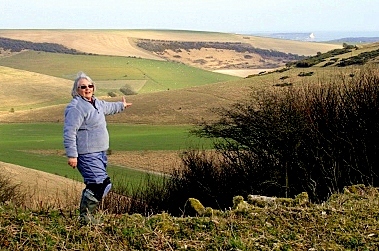 She was the last person to be born in Newmarket Farm, but just 6 month’s later her family had to leave so the farm could be used for target practice during WW2, so she has no memories of living there. Bob Phipps and myself on a tour of the site. Peggy and Bob share memories. 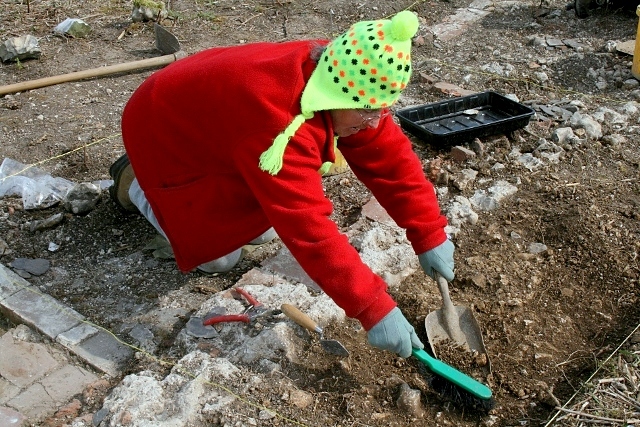 Bob Phipps, who visited the dig for the first time on Sunday, also used to live there as a child. Being older he does have some clear memories of the cottage as it used to be. 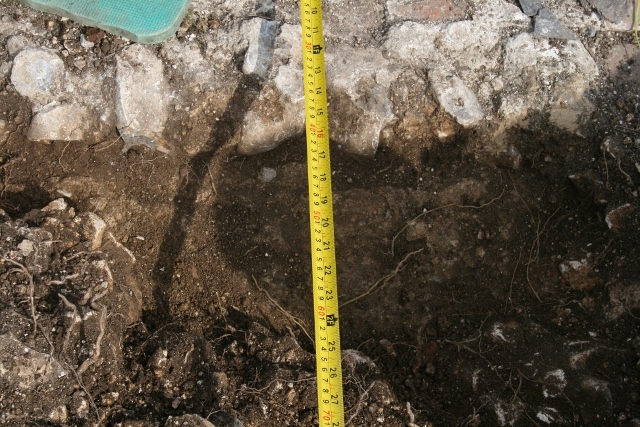 Extending excavation of tiled floor. 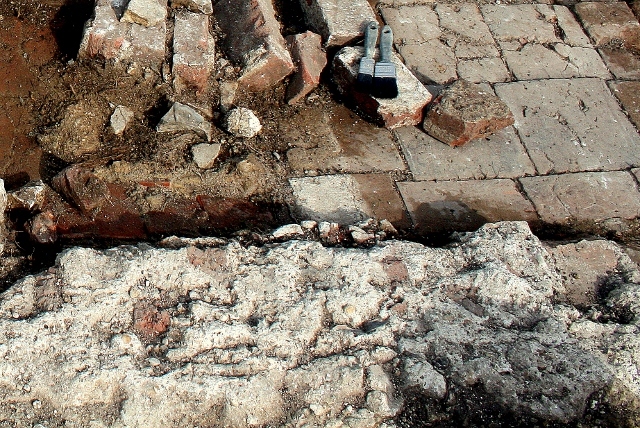 The excavated area of the terracotta tiled floor of the ‘pantry’ under the stairs was extended, as the demolition rubble was carefully cleared. 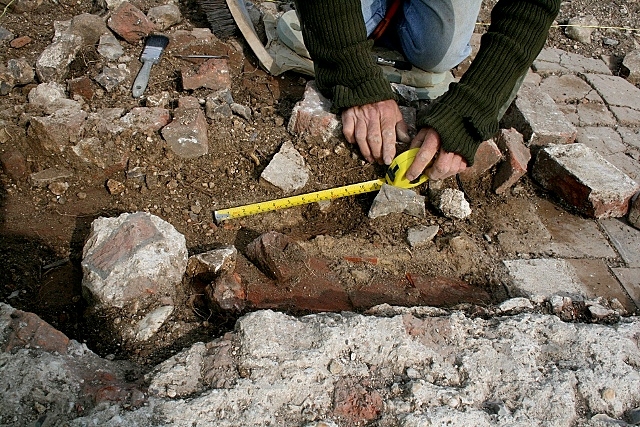 The tiles were found to extend under the probable location of the stairs to its north, and are likely to extend right across what was the old scullery floor. This (in my opinion) could be evidence for the house having been constructed to a high specification. Oscar Selbach, who owned it in the early 1920’s – almost 100 years after Newmarket Cottage was built for farm labourers – drew plans for the labourer’s houses he hoped to build. These were to have earth floors for their sculleries, not beautiful terracotta tiles. Mortar line, north end of pantry. This line of mortar almost certainly formed the northern edge of the pantry under the stairs. 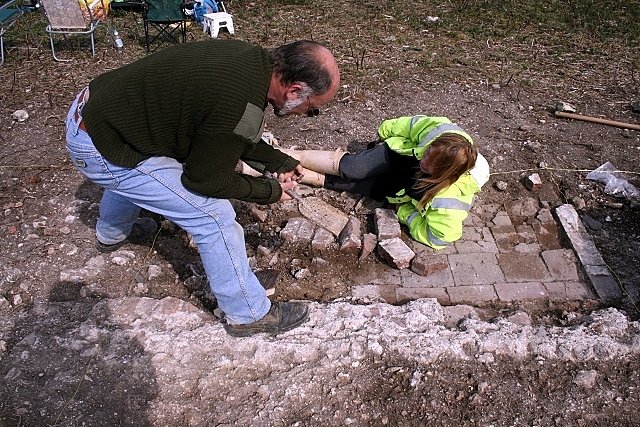 Excavating fragment of wood – possibly remains of stairs. 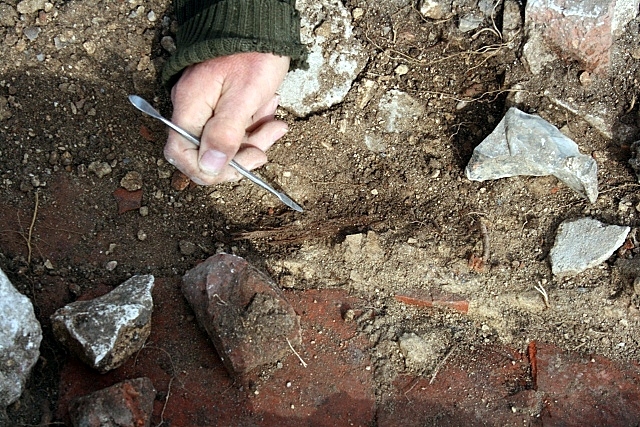 Excavating a fragment of wood – possible stair remnant. 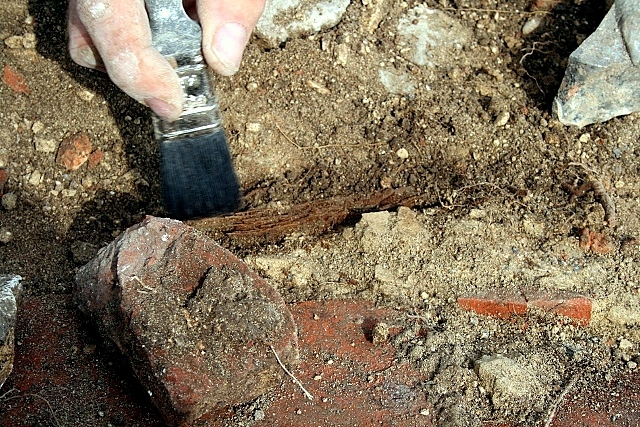 A dark brown fragment of badly decayed wood was revealed – perhaps part of the stairs. Sadly it was far to small and decayed for dendrochronology! 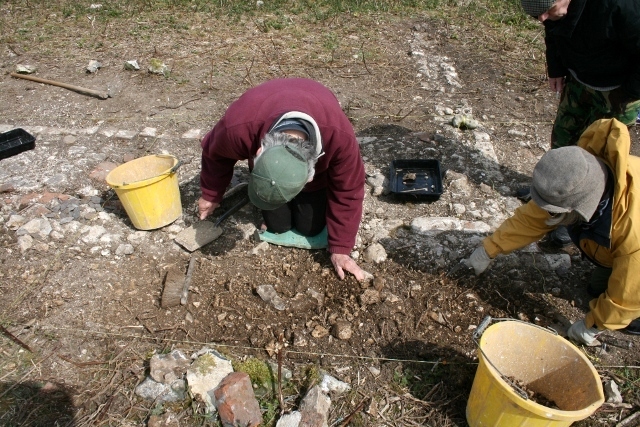 Excavating chalk rubble surface against side of house. 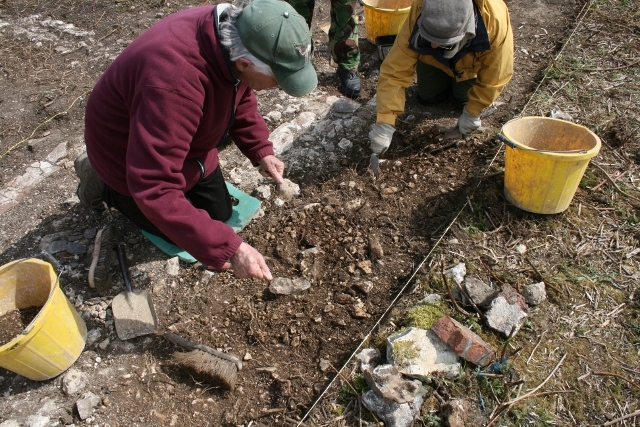 South of the pantry, the chalk rubble fill in the farmyard, butting against the house wall, was further excavated. 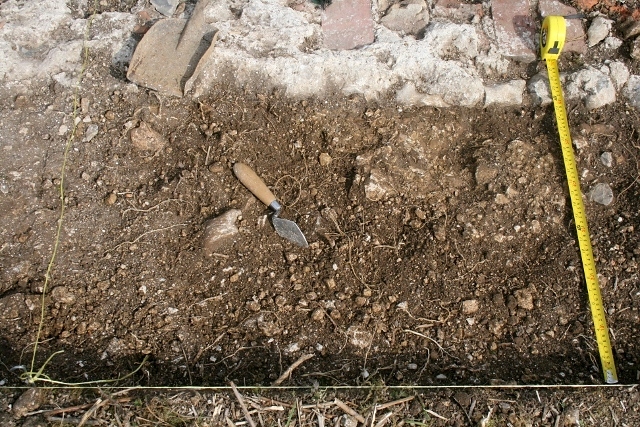 A small area of compacted surface was meticulously revealed. This is likely to have occurred during the construction of the house, for those who lived there have reported that the farmyard was cobbled. Excavating W side of house towards its S end. A partial circle of flints. 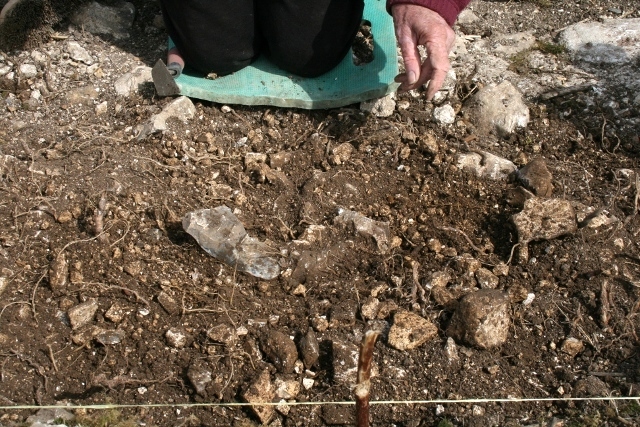 Further to the south again, the top of this chalk rubble fill contained a loose fill of flints. An approximately circular arrangement was observed. A clear interpretation is difficult because there is no clear stratified horizon between the demolition fill, the bulldozer and/or WW2 ordnance cut, and the fill below that. 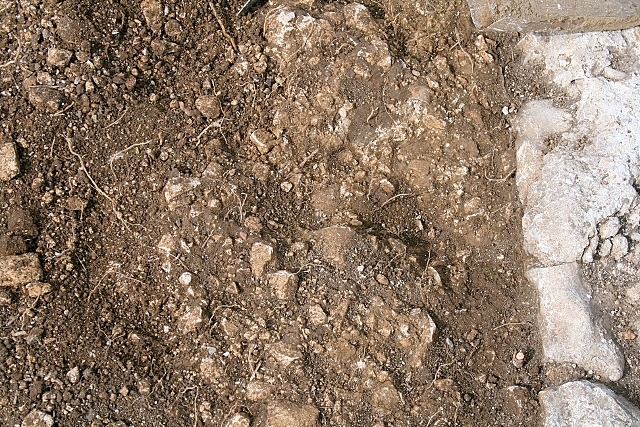 If these flints are the remnants of an in-situ feature, they may be the packing for a post used as scaffolding during construction. 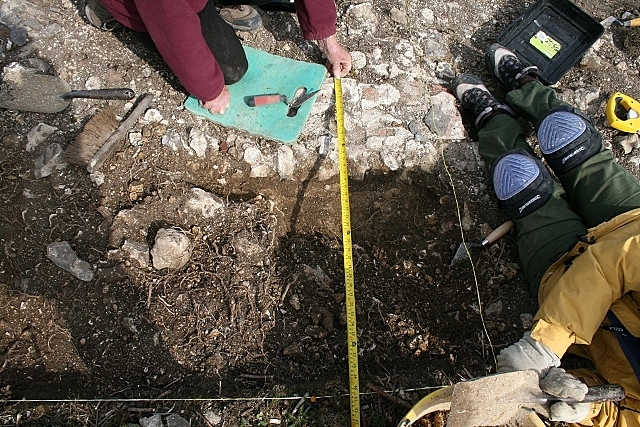 Further excavation, to a deeper level, revealed a wide bed of mortar upon which the outer wall of the house sat. 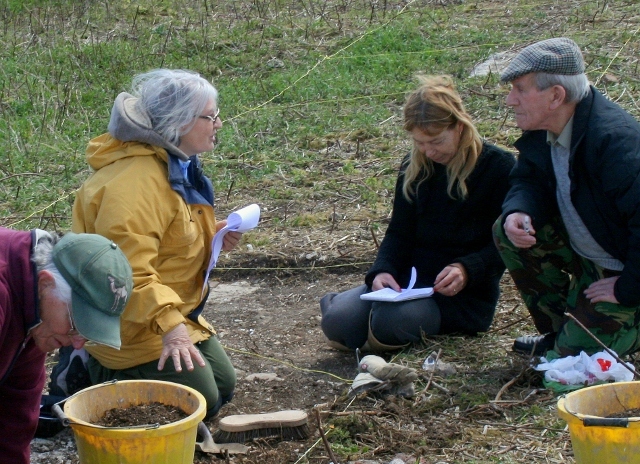 The dig has also been gaining the attraction of a number of walkers, many of which are interested in the history of this area.